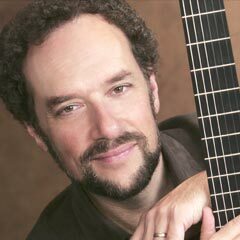 Recognized as one of America’s finest classical guitarists, William Kanengiser won first prize in the 1987 Concert Artists Guild International Competition, as well as major international guitar competitions in Toronto (1981) and Paris (1983). He has developed a unique repertoire for his instrument, ranging from arrangements of Mozart, Handel and Bartok, to his innovative excursions into the music of Eastern Europe and the Caribbean. He was twice awarded a Solo Recitalist Fellowship Grant from the National Endowment for the Arts, and his debut recording for the GSP label won an “INDIE” award for Best Classical Recording. A member of the guitar faculty at the USC Thornton School of Music since 1983, Mr. Kanengiser has given master classes around the world and produced two instructional videos, Effortless Classical Guitar and Classical Guitar Mastery for Hot Licks Video. As a founding member of the Los Angeles Guitar Quartet, he has toured extensively throughout Asia, Europe and North America, recording for the GHA, Delos and Sony Classical labels. Their first recording for the Telarc label, LAGQ: Latin, was nominated for a Grammy in the Classical Crossover category in 2001, and their follow-up recording LAGQ’s Guitar Heroes won a Grammy in the same category in 2005. Mr. Kanengiser recently released his fourth solo recording for the GSP label entitled Classical Cool, featuring jazz-inspired compositions and arrangements for classical guitar. How would you describe the spirit of the USC Thornton classical guitar community? There are many fine university and conservatory programs for the guitar — however, I think one aspect that sets USC Thornton apart is the truly supportive environment. Every student is pushed to reach his or her own potential, but never with a sense of one-upmanship. It’s part of the legacy of Jim Smith, who helped to create a feeling of the department almost being a “family,” rather than merely a crowd of students, and also by the nurturing manner of Pepe Romero. If you speak to any former or current student, I’m sure they would tell you the same. The feeling among the faculty and students reflects a caring, respectful, and positive attitude. What special career development projects are USC Thornton classical guitar students or graduates involved with? Getting all the skills and strategies for building a professional life with the guitar is one of our primary goals for USC Thornton guitarists. Of course, technical competence and musical understanding are vital tools — but we realize that they’re only a part of starting a career. Developing a personal style that sets oneself apart and learning to become comfortable onstage are important skills. One of the requirements for all students is participation in USC Thornton Outreach concerts, where students play for appreciative audiences at the Braille Institute, the Rescue Mission and nursing homes throughout the area. 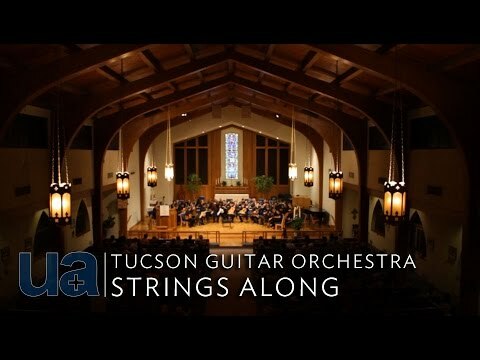 The USC Guitar Orchestra, which I conduct, has performed in major venues in Los Angeles, including the Los Angeles County Museum of Art and Soka University. I also helped to organize a tour for the Helios Guitar Quartet, which is made up of recent graduates, and assisted students Andras Csaki and Mak Grgic with career development strategies. We try to act as mentors for motivated students to help them begin their lives as performers. What is the importance of masterclasses at USC Thornton? No matter how good the individual instructor, we feel that it’s vital for students to be exposed to alternative viewpoints and ideas. Masterclasses are a mainstay of our program. Not only are these classes inspirational, but they also offer a chance to showcase our students to the community and present yet another important performance opportunity for our students. We are so fortunate to welcome Pepe Romero twice each semester, first to give private lessons to each student, and then to give his famous public masterclasses. We also hold at least four other classes each year with respected figures in our field. Last year, we welcomed Roland Dyens, Paul O’Dette, the Eden/Stell Duo and David Russell. Not a bad lot! Why is it important for music students to explore the many opportunities available at USC beyond the Thornton School? As a six-year Trojan student, a thirty-year Trojan professor, and a two-year Trojan father, I’ve seen USC from many perspectives. I’ve absolutely loved all of my relationships with USC and I couldn’t think of any school I’d rather be associated with. While some students seek a very targeted learning environment that only focuses on music and their instrument, I find that striving for a broader education helps music majors become well-rounded artists and individuals. USC Thornton stands alone in what it can offer as a world-class conservatory surrounded by a world-class academic and research institution. With access to leaders in almost every discipline imaginable, our guitar graduates have studied subjects ranging from astronomy to zoology — with plenty of jazz, flamenco, neuroscience and semiotics in between. To make the pesto: Wash and dry 1 cup fresh basil. Crush one garlic clove, place in food processor and puree. Add basil until leaves are finely crushed. Sprinkle in salt and freshly ground pepper to taste, add pine nuts and blend. With processor running, drizzle in about ¼ cup of high-quality olive oil, until just emulsified. Stir in grated parmesan or pecorino cheese. Preheat grill, set marinated chicken breasts out to come to room temp. Grill on medium to high until cooked through. Set aside to cool. Slice ripe tomatoes into ¼ inch slices and mozzarella into ¼ inch slices. Gently pat the tomato and cheese slices dry with paper towels to remove extra moisture. Slice fresh rolls in half. Once the grilled chicken has cooled a bit, slice into ¼ inch slice on the diagonal. Assemble the sandwiches: Liberally brush the bottom slice of the roll with pesto, place a layer of sliced chicken, then a layer of sliced mozzarella, then a basil leaf, then a slice of tomato. Optionally, drizzle some balsamic glaze and put the top of the roll on the whole assembly. Grill in a Panini press or simply cut in half and enjoy. Mangia!